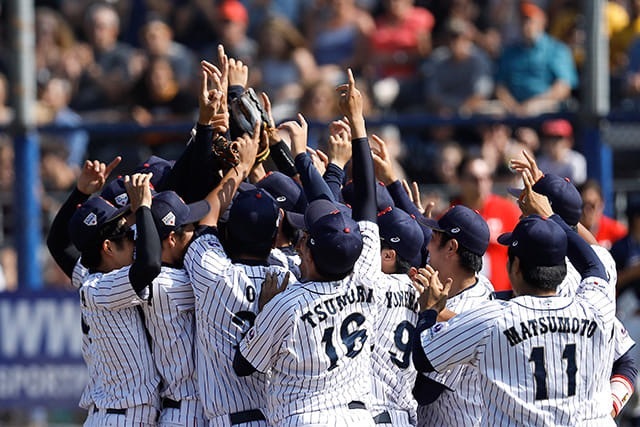 Japan won Gold Medal by defeating Chinese Taipei 5-0 at Pim Mulier Stadium in Haarlem, Netherlands on July 23, 2018. Team Japan was represented by the Collegiate National Team which played 5 games of 42nd U.S. vs. Japan Collegiate All-Stars Series in the U.S. from July 3 to 9 and flew from U.S., to Netherlands. This was Japan’s 4th title overall since 1994. In the top of 4th inning, Kodama of Japan singled to pitcher, advanced to second by sacrifice, then to third by Tatsumi’s single and scored on a fielding error by right field. Japan widened the gap in 6th inning after Sato scoring a run by Tatsumi’s hit, Iwaki homered to left center with two runners on bases. Chinese Taipei was held scoreless by 4 Japanese pitchers, MORISHITA Masato; MATSUMOTO Wataru(4); ITO Hiromi(6); KAINO Hiroshi(8) and UMINO Takashi. Captain TATSUMI Ryosuke was awarded Most Valuable Player and MATSUMOTO Wataru was chosen as Best Pitcher(3 wins).